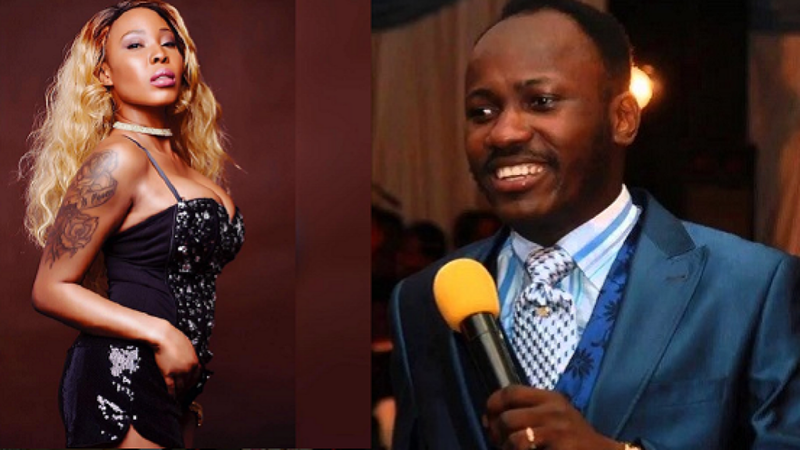 Ms Stephanie Otobo claimed that she got pregnant for Apostle Suleiman. She claimed that in September 2016, she visited Nigeria and told the preacher that she was pregnant in a hotel she was lodged in Ikeja, Lagos. The news of the pregnancy angered Apostle Suleiman, who apparently was afraid of the scandal such could bring. He wanted her to have an abortion and proceeded to give her a concoction, which made Miss Otobo bleed profusely and subsequently abandoned her, calling off the marriage proposal. Miss Otobo later went to Warri, where he met another pastor and told him his story. The pastor recorded her story and started using it to extort money from Apostle Suleiman. After the disagreement over the pregnancy, Miss Otobo returned to Canada. But Apostle Suleiman got in touch with her and apologized for abandoning her. He subsequently started to persuade her to return to Nigeria. Last week, Miss Otobo returned to Nigeria. Apostle Suleiman, working on a scheme to silence her, paid money into her account and then got the account frozen. It was while Miss Otobo was trying to make a withdrawal from her account, having tried unsuccessfully to use an Automated Teller Machine, that she was arrested on the orders of Apostle Suleiman.